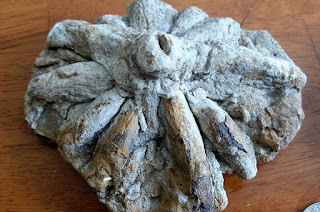 Today's post is a very interesting set of fossils which I initially did not know what they were. 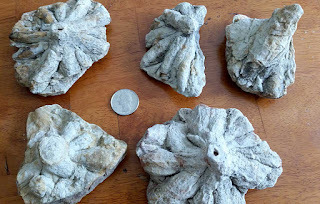 I received an e-mail from the granddaughter of a person who found these specimens in the Estill County, Kentucky USA. Luckily, Dave at Views of the Mahantango blog was able to identify them as Asterosoma sp., a worm/shrimp? burrow trace fossil. They appear to be from the Breathitt Formation of Pennsylvanian Period. Thanks to Tamara for letting me post these pictures.